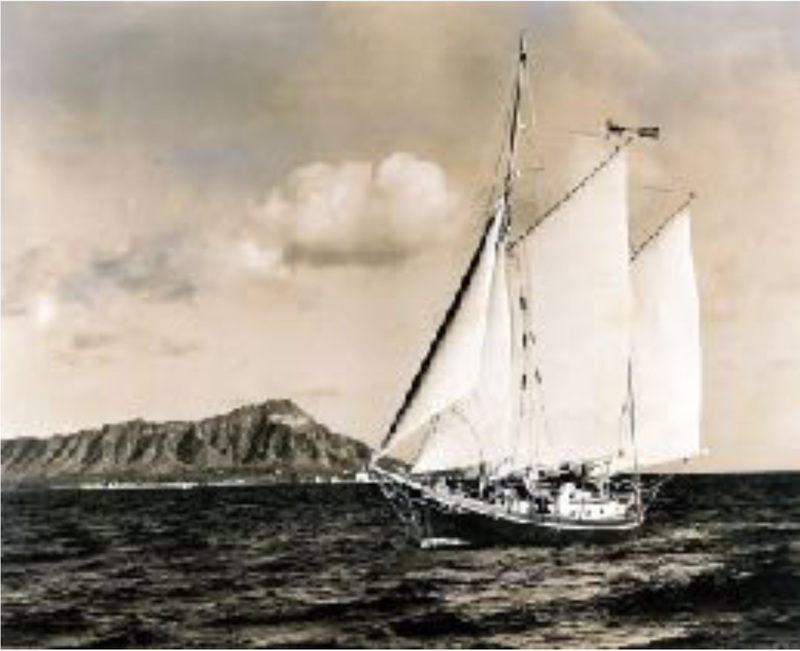 Return to 1946 and sail amongst our beautiful islands with the Powlison Family and friends aboard the Mokuola. Come watch a 16 mm color film taken by Ted Bredesen (navy photographer who married Puna Peggy 40 years later). It also includes an eruption on the flanks fo Mauna Loa, old-time Waikiki surfing, and area scenery of Kailua, Lanikai, and other islands. Generously shared with the community by Cosette Harms and son Jerrett Harms. In 1946, Kailua’s population was under 5,000. The biggest store was Harada’s (at Ku’ulei and Kailua). Two churches existed—St. Anthony’s and the “Little White Church” (where Salvation Army is now located). Campos Dairy leased many acres in today’s business district and the surrounding areas. Several dozen homes were standing in and near Lanikai, including the Freeman’s, Tanaka’s, Hedemann’s, and Powlison’s. Mid-Pacific Golf Course, a popular attraction was 17 years old. The Kailua Race Track still existed, as did watermelon farms throughout the Coconut Grove area. Sullivan’s first store, today’s Foodland, would soon be built across from Kalapawai Market (near Kailua Beach), as would Kailua’s first post office nearby. Everyone is welcome to join us for this free amazing movie and program about 1946 Kailua. Tuesday, Dec. 6, 2016 at 6:30 p.m.
for a staged reading of excerpts from “December 7, 1941: Letters from Hilltop House” by Cosette Morrison Harms. Through a series of letters to her son on the mainland, the author’s grandmother, Anne Powlison, describes witnessing both the bombing of Kaneohe Naval Air Station (concurrent with the bombing of Pearl Harbor) from the family home overlooking Lanikai and the frenetic weeks which followed. As the family and the territory itself copes with the ensuing confusion of blackouts, paranoia and an expected imminent invasion, Mrs. Powlison finds herself cut off from reliable communication with the mainland and her son at university in Washington state. Her steady stream of letters help to bolster not only her own courage, but those of her son’s as well, and bear testament both to life on Oahu during wartime, as well as the enduring resilience of the human spirit. Performers from KOA Theater will perform a selection of these letters, interwoven with historical interviews and news reports, to bring to life the dark days of uncertainty that followed the attack on Pearl Harbor and the fortitude of Hawaii’s citizens in the face of the unknown. This photo of Kawainui is taken from Ulupo Heiau’s vantage point, adjacent to where we will be walking. Within a stone’s throw of Kawainui’s levee lies an acreage virtually unknown and out of sight. Had the homeless encamped there remained invisible, this historically significant area would not have become a public opportunity for further education. But the opportunity is now very real, thanks to the recent clearing efforts done by the State’s DLNR. Driving into Kailua along “Church Row” over the past month, one could not have but noticed the hau thicket being pulled back and the narrow embankment exposed. It may have seemed an insignificant acreage before, but, in fact, the opposite is true. A century ago, for example, a large pump ran non-stop sending millions of gallons of precious water to the thirsty sugar cane fields in Waimanalo. Centuries before it may well be that the Marsh’s water, in that same location, was flowing through fish ponds with gated chambers, as the water flowed into Kaelepulu Stream. Clearing the hau has revealed many hidden remains of human habitation, including hale remnants photographed soon after its discovery in 2013. The ring of stones you can see at the right was part of the foundation of a simple 3-room hale. Unlike most areas lying on the southern bank of Kawainui, this parcel has relatively been spared the massive soil disturbance of heavy earth-moving equipment. So come to see with your own eyes the three types of human impact still preserved: the Hawaiian culture, the Japanese immigrants, and the homeless. Because the terrain is uneven and the walkways not well formed, good walking shoes are required. Mosquito repellent is recommended. Parking is provided by St. John’s Lutheran Church. The tour will begin Sunday, November 13, 2:30 p.m. in the parking lot and will end approximately an hour and a half later. Faith Baptist Church, 3-5 p.m., free. 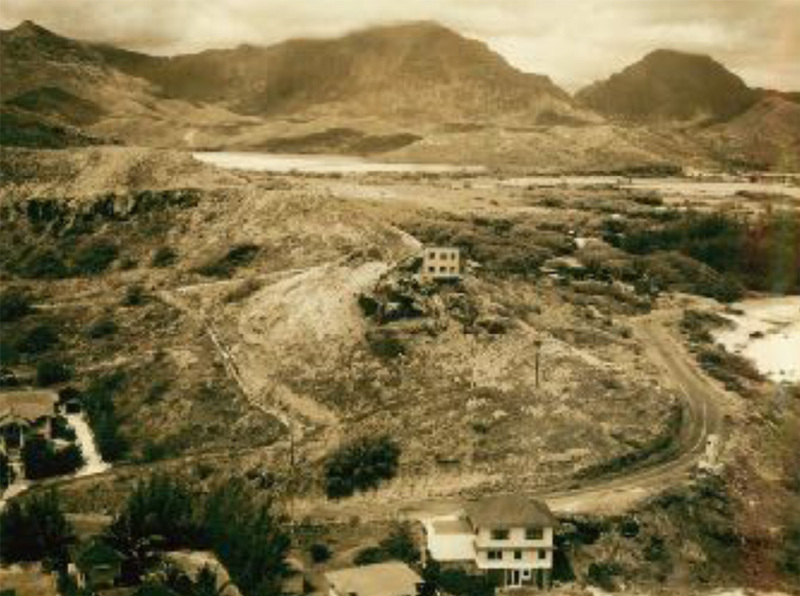 Kailua Historical Society reminisces on the Dec. 7, 1941, bombings of Bellows and Mokapu and their effects on the area from the Kailua perspective. Annual Kailua Meeting coming up! “Kailua Blue” comes in many shapes, sizes, and, of course, colors. The White House may have its own elegant, official chinaware, but in our little seaside town, we have our own “place settings” appropriate to the values of the past. For one kamaaina family it might be hukilau nets, for another, calabashes, and for another, ukuleles. Whatever has been handed down through the generations—from keepsakes to collectors’ items to sentimental objects—family members have carefully preserved and treasured them. Or, they may well have forgotten such pieces until rummaging through their attic. The Kailua Historical Society will bravely uncover this subject in its public program on May 17, 2015, from 3:00 – 4:30, on the outdoor lanai of Faith Baptist Church (1230 Kailua Road). Departing from its usual practice of highlighting historical themes, the Society chooses to air the subject of how to recognize documents and objects with common historical value, and how to transfer them to other forms of usefulness. Practical advice for restoration and preservation will be shared. Speaking on the subject will be DeSoto Brown from the Archives Department of the Bishop Museum. A life-long collector himself, and a professional archivist as well, DeSoto will give practical advice for distinguishing between trash and treasure. 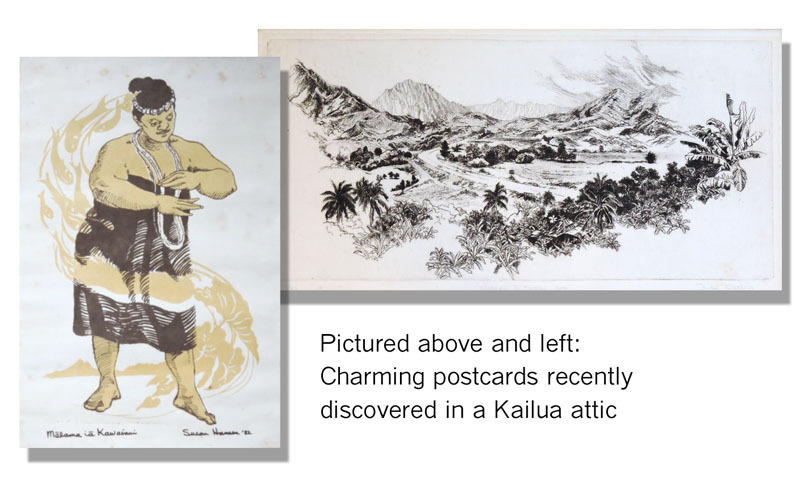 Introducing this subject will be three Kailua families, bringing different illustrations of what they have found in their own “attics” and how they have chosen to not only “clean out” their own space, but to share their treasures with others as well. Come expecting a lively discussion, as well as to be inspired and learn from your neighbors as well. In Kailua’s time-honored practice, prepare also to carry home with you someone else’s “trash”. Feel free to post or share our flyer for the upcoming event! Have you ever found a stash of antiquated tools, wonderful vintage postcards, or newspaper archives yellowed with age? Do you wonder if these items have historical interest beyond your own family? Are you baffled about how to best store them or donate them? Mark your calendars and start thinking of good questions about archiving and sorting historical items in your family or personal collections. We will be having our next event on May 17 at 3:00 at Faith Baptist Church. Desoto Brown has agreed to come to speak on our theme, “Cleaning Out Kailua’s Attic: Trash or Treasure?” More details to come soon.